Home The Historian Where Did Minoans and Mycenaeans Originate? Where Did Minoans and Mycenaeans Originate? Posted about 2 years ago | Comments Off on Where Did Minoans and Mycenaeans Originate? For the first time, scientists have obtained and analyzed genome sequences from the ancient Minoans and Mycenaeans, who lived three to five thousand years ago and were Europe’s first civilized people. 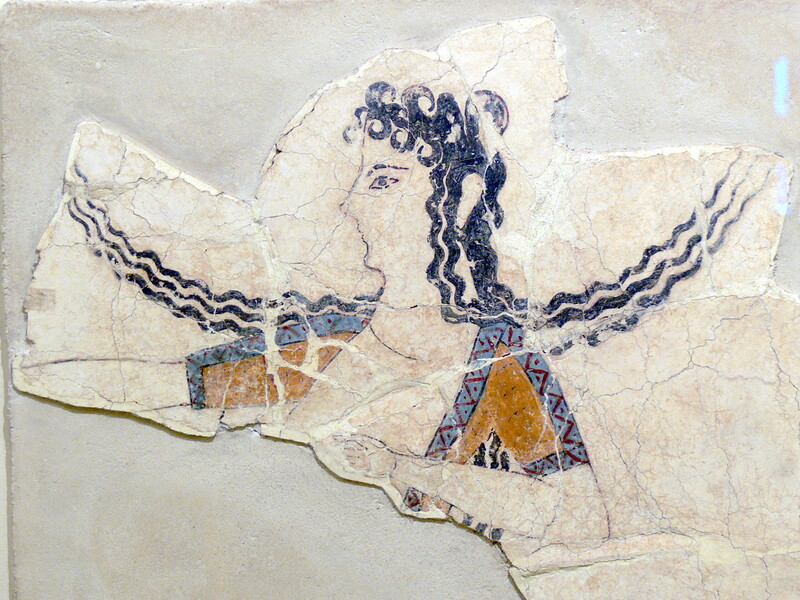 The Minoans were a literate Bronze Age civilization that flourished thousands of years ago (one woman shown dancing, in a fresco fragment that dates from 1600-1450 BCE). Their origins have been intensely debated. Theories include migrations from various locations, including Europe and Asia Minor, and at various times before and during the Bronze Age. Both cultures were literate and had writing, but the Minoan language hasn’t been deciphered. The Mycenaean language, an early form of Greek, is part of the Indo-European language family, whose languages have been spoken across Europe and central and southern Asia since the beginning of recorded history. The identity of the Minoan language is unknown. But despite extensive archeological and linguistic research, the origins of both cultures and their relationship to each other and to other Bronze Age peoples have remained a puzzle.Reich and his colleagues’ work suggests that about three-quarters of the ancestry of both peoples derives from the first farmers of the Aegean Sea, including western Anatolia (a region that lies within modern day Turkey), Greece, and the Greek islands. But, quite different from the rest of contemporary Europe and from the first farmers of Greece, the Bronze Age Greek civilizations also derived a small part of their ancestry from populations from the Caucasus and Iran. The Minoans, based on the island of Crete from roughly 3100 to 1050 BCE, were a maritime people with sophisticated palaces, one of which was so large and complex that it may have been the historical basis of the myth of the Labyrinth, home of the beast called the Minotaur. The Mycenaeans of mainland Greece, 1700 to 1100 BCE, who eventually conquered the Minoans, were skilled engineers and fierce warriors. Their culture is named for Mycenae, a site with a fortified palace that was the seat of the celebrated King Agamemnon, who led the Greeks in the Trojan War. Reich and his colleagues at the Max Planck Institute in Jena, Germany and the University of Washington teamed up with Greek and Turkish archeologists and anthropologists to obtain samples from 19 Bronze Age individuals excavated from tombs and other sites throughout the Aegean. The ancient DNA, carefully extracted from bones and teeth, included 10 Minoans, four Mycenaeans, three individuals from southwest Anatolia (Turkey), an individual from Crete that dates from after the arrival of the Mycenaeans on the island, and one Neolithic sample (5,400 BCE) from the mainland that predated the emergence of the Greek civilizations. The researchers then compared and contrasted the new DNA samples with previously reported data from 332 other ancient individuals, 2,614 present-day humans, and two present-day Cretans. The new study also shows that the Mycenaeans have additional ancestry that is distinct from the Minoans, says Iosif Lazaridis, a postdoctoral researcher in Reich’s lab and lead author of the study. This genetic contribution may be from people of the steppes north of the Black and Caspian seas. Scholars have debated whether the Indo-European language, which gave rise to Italic, Germanic, Slavic and Hindi languages, among others, spread with migrations from Anatolia or from the steppe. Previous work by Reich and colleagues supports the “steppe hypothesis.” Their latest data suggest that the speakers of this early Greek language may have formed the southern portion of the same migrations that contributed to the dispersal of other Indo-European languages, Reich says. “This increases the weight of evidence that Greek was derived from the same expansion of peoples,” he says. While the research sheds light on the origins of these ancient Greek civilizations, questions remain, notes Reich. For example, it’s still unknown when the common “eastern” ancestors of both Minoans and Mycenaeans arrived in the Aegean. And details regarding the “northern” ancestry found only in the Mycenaeans remain to be worked out, like whether that contribution came in a single rapid migration, or sporadic waves over a long period.